It is good and pleasant for born-again brethren to dwell in unity—a unity centered on their shared faith in God and obedience to His Word. But, instead of this holy kind of unity, Satan and the fallen celestial rulers of the present wicked age are building a mechanical, counterfeit religious unity, a one world religion, based in their shared rebellion and lawlessness toward God and his Word. Roman Catholics with Jews the pope meets with Jewish leaders to discuss a United Nations of Religions. Protestants ‘Churches’ merging with Roman Catholics Prominent Pastor Rick Warren promotes Protestant/Catholic unity. Roman Catholics with Orthodox the pope builds bridges with Orthodox leadership. Roman Catholics with Muslims the pope prays in a Mosque with Muslim leaders. 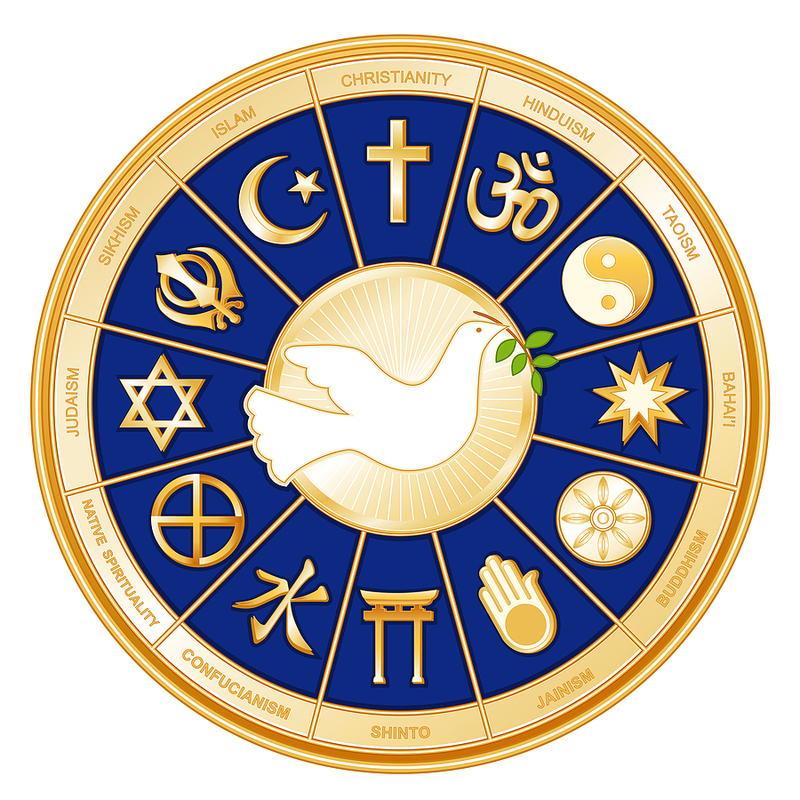 United Nations Interfaith Harmony Week is held every February. It’s a way to promote harmony between all people regardless of their faith. Notice that it’s not an apostasy, but the original Greek text explicitly uses the definite article “the,” labeling it the apostasy. It’s the greatest apostasy in world history. The apostasy is commonly referred to as ‘the Great Falling Away’ from the true faith. So, what is it? For centuries, the majority of ‘Christian’ Catholic and Protestant believers have been on varying degrees of descent into complete apostasy. They’re ignorant of God’s Biblical commands and calendar, following the world’s traditions and calendar instead. For example, they celebrate Ash Wednesday and Lent, and take their children on Easter egg hunts instead of celebrating the perpetual, Biblically-mandated feasts of Passover, First-fruits, and Unleavened Bread. They also ignore the autumn feasts of Trumpets, Atonement, and Tabernacles, which are soon to be fulfilled; substituting Halloween harvest festivals, Thanksgiving, and Christmas in their place. In these last days, the apostasy will increase, as the majority of churches reject obedience to God’s Word. In its place, they’ll follow this world’s religious leaders (i.e., Rick Warren, Kenneth Copeland, the Pope, Dalai Lama, etc.) in accepting a mishmash of humanistic, man-made religious doctrines that Jews, Muslims, and ‘Christians’ can all agree on. Entertain them with an upbeat musical “worship package.” The last song should evoke strong emotion. Fleece the sheep (harvest their money) before the musically-induced emotion fades. Feed them a feel-good, seeker-friendly message for not more than 30 minutes. Encourage them to bring their friends next week, so that they can feel good too. Send them home with the false assurance that anything they do is OK because it’s all covered by God’s grace. The pecking order for false shepherds’ prestige is always governed by their relative number of weekly attendees and offerings. Whenever two of these hirelings meet, they’ll inevitably compare their congregations’ attendance and offering numbers, and their respective ranks in the relationship are automatically determined by these numbers. In contrast, when Jesus taught His followers that He was the Bread of Life, most of His followers left Him. So, a Godly minister’s only metric of success is whether the Living God’s will is being done, whether or not it’s popular. Topics like the Feasts of Israel, the 4th Commandment, the blood of Jesus, repentance, discipleship, obedience to God’s Word, persecution, sacrificial suffering, martyrdom, prophecy, God’s judgment, the Antichrist, Armageddon, and God’s expectation of our practical holiness are generally avoided by the vast majority of today’s ‘Christian’ leaders. As a result of these false shepherds, 99.999% of the people who attend today’s Catholic and Protestant churches are ignorant of what the Bible actually teaches about these things. So, if you’re in the Christian mainstream, chances are you’re not going through the small gate on the narrow way that leads to life. The result of this ignorance is pervasive lawlessness in the church. They will fill God’s temple with the glory of their redemption–which God accomplished in them through Christ Jesus. God will first judge His Church, and then He will judge the nations. When He judges the Church, only faithful, obedient disciples will remain standing in His presence. When He judges the nations, nobody will be able to stand. True Christians, who obey the Bible, will soon be persecuted as mentally ill, violent extremists, terrorists, bigots, etc. Indeed, the foundation for this persecution has already been laid. In the hyperlinked article below, Pope Francis and retired Israeli president Shimon Peres are working to create a “United Nations of Religions,” but ‘fundamentalist’ believers won’t be welcome. “There is one type of Christian that Pope Francis does not have anything positive to say about. Pope Francis says that there is not any room for “fundamentalism” in Christianity… Following his first visit to the Middle East as pope last month, the pontiff criticized fundamentalism in Christianity, Islam and Judaism as a form of violence. Sincerely ask God to forgive you of your sins. Turn from your sinful nature and ask Jesus to lead you into a life of obedience and holiness, according to God’s word. Study the entire Word of God, so you won’t be ignorantly deceived and swept away in the apostasy now sweeping the religions of the earth. Fellowship together with other sincere, obedient disciples of Jesus. If your church is following the ‘religious process’ formula above, immediately start searching for another congregation that teaches and expects you to follow the whole Word of God. Mentally and spiritually prepare to be persecuted for your faith in God and obedience to His Word.